The Hero series from Noblechairs is very much built with the modern gamer in mind. It's solid and sensible - ideal for people who care more about their physical comfort and posture. No cup holders or built-in speakers here, nor footrests or other unnecessary gimmicks. The design is understated and simple, meaning that the chair looks perfectly in keeping with a modern office or - at a push - a living room. 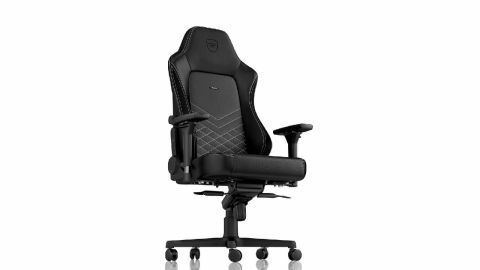 In other words, this is a chair designed for players who not only care about comfort during marathon gaming sessions, but also for adults who care about their posture and the look of a large accessory in their home space. If you're looking for something a little more garish, with all the fancy bits, I'd recommend looking elsewhere - this is fairly low on extra features. But for a solid, supportive chair that will serve you during work as well as play, the Hero is a great choice. I've tested the standard 'Hero Black / Platinum White model' in PU leather. Here's what you get for that $400 / £350 investment. First things first: how long does it take to build, how difficult is it, and how do the component parts actually feel? It took me about 40 minutes to construct the chair, from opening the box, and there was one point that required another person to help me hold a piece of the chair. I'd allow an hour, just in case. The instructions are very clear, and actually building the chair is simple enough - you get a special alum key/screwdriver provided, so there's no messing around trying to find the right tools. The only tricky moment comes when attaching the back of the chair to the base, as it's tough to find the right angle to get the bolts into the screw-holes. You'll need another person to just hold the back in place while you screw it together, but there's no strenuous work required. The seat cushions themselves are delightful in terms of quality, but a couple of the plastic pieces of trim don't quite match the same standards. A couple of the adjustment buttons aren't quite flush, and they don't always click slickly into place. These are incredibly minor issues, however, as the overall chair - once constructed - looks incredibly elegant and most of the plastic trim is hidden away. The chair itself is comfy to sit in, and will suit anyone who wants a firm seat rather than a lazy chair. The Hero series is specifically designed to be used as an office chair as well as a gaming one, so it's designed to support your back and arms first and foremost. The back follows the curve of the average person's spine, and the level of lumbar support can't be adjusted with a dial on the right of the chair. It makes a decent difference too, so you should be able to find a setting that suits you. If you're looking for a chair to lean back and slouch in, this isn't for you - the Hero simply won't let you twist into a poor posture, which is a benefit for sure. You can adjust the height easily, and there's a lever to change the lean of the backrest. This lever is a little stiff to begin with, so it's not the easiest to adjust, but once in place it feels solid; unlikely to slip or move unexpectedly. The height adjustment handles are fairly standard plastic, and easy to adjust. You can also set how springy the rocking motion is, or switch it off altogether. The arm rests use what Noblechairs refers to as 4D tech, meaning they can be adjusted upwards, back and forwards, and can be angled inwards from the straight-facing position. While the buttons on the arm-rests feel a little cheaper than the rest of the chair (and this is one of the few, very minor issues I had with the Hero), the functions themselves are incredibly useful. You'll definitely be able to find an arm position to suit you, and you can adjust these parts to switch between your posture when holding a pad or tapping on a keyboard. The Hero chair has a very an understated design aesthetic. The entire series comes in black, with different kinds of subtle trim, but rarely feature garish racing stripes, and none have overly large logos. Again, this is to allow the chair to double-up as an office seat as well as a gaming one, so it's deliberately muted. Ok, this means it lacks a little fun, so depending on what you want, this could count against it. The stitching is high quality, the leather or PU leather of the seat is comfy, and the plastic is smooth enough for your arms. The chair itself is quite long in the leg, so shorter people may struggle to get their feet on the ground in a more laid-back mode, and the back is high too, meaning that the headrest and curve of the spine-support will really benefit taller users. Adjustments can be made to accommodate smaller people, but most features seem designed for larger users, so this isn't a chair that'd be suitable for children and younger players. Overall - should you buy it? The Noblechairs Hero is a damn good chair, but it certainly won't be for everyone. What you're getting here is a sensible gaming chair, which easily doubles-up as a more professional seat for those who like to mix work with play. Let's put it this way - if your significant other isn't a gamer, they'll be fine with you having this chair in your home. That's a big plus. It's firm, and takes a bit of wearing in, but is very sturdy and visually tasteful. Assuming you're paying $400 / £350 for it, the Hero represents good value for money, and your posture will definitely thank you for it. However, if you're looking for something to slouch in, and to hold your drinks and make you feel like you're in the seat of a Ferrari, it's best to look elsewhere. Looking for more options? Here are the best gaming chairs currently available.